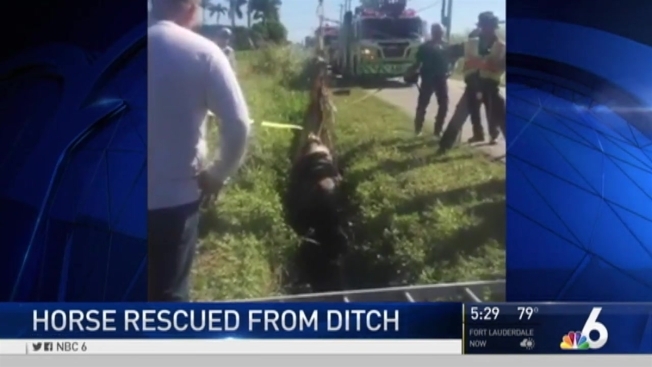 A large horse needed help from a rescue crew after it became stuck in a ditch in south Florida Tuesday morning. A tactical animal rescue team responded to the area of Southwest 168th Street and 199th Avenue in Homestead to help the horse, Miami-Dade Fire Rescue officials said. A man riding the animal after the rescue said a car sped by, scaring the four-year-old quarter horse named Castigo. The horse slipped into the narrow ditch. "They found there was a horse whose head was a couple feet under the road line, the grade line, so we knew they'd need to set up some technical rescue systems to help get the horse out," Miami-Dade Fire Captain Jack Swerdloff said. The team of workers was able to hoist the spooked horse out of the ditch and get it back on level ground. It's a scenario they train for, since it happens once or twice a month, Swerdloff said. "The tech rescue guys at FS 43 created a mock horse built out of steel and concrete [that] weighs 1,000 lbs. It allows the team ... to rotate through and practice securing the horse to lift it out," Swerdloff said. The horse suffered a few scrapes but was otherwise all right, and its handler was very thankful for the speedy rescue.